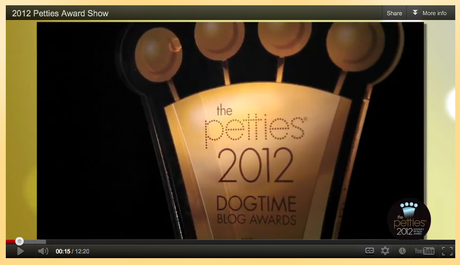 This year’s Petties were the biggest ever! Wiinners were announced in ten blog categories, including two new ones, Best Pet Product Review Blog and Best Video Post. In all, over $30,000 was given away in donations to shelters and rescues across the country, bringing the total giveaway to over $50,000 since the program was started in 2010. The winner of the Unsung Hero award, another new category for 2012, was also announced. The award was created to recognize an outstanding shelter or rescue volunteer, and nominations from the public poured in. We selected ten honorable mentions and are delighted to honor this year’s Unsung Hero award recipient: Lou Hays. In addition to his Pettie award, Lou wins a $10,000 donation for the shelter where he’s devoted so much of his time, the Humane Society of Cherokee County in Oklahoma. “I was returning from a dog transport to Chicago when I got the news on Friday, and I nearly ran my transport van off the road!” an elated Hays told DogTime. Maggie Marton, Oh My Dog!